Kyon is a first year high school student. He is quite cynical and does not believe in anything interesting like aliens or espers (Though it's possible he believed in them before). But his curiosity gets the better of him when he tries to talk to Haruhi Suzumiya. She starts the SOS Brigade, and drags Kyon into it, where he tries his best to stop Haruhi from causing too much trouble. 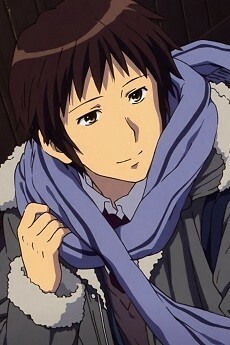 Kyon is the second person to join the SOS Brigade, and is the "fourth seat" of the group. He is the only member of the group who is "normal", having no special abilities at all. He is enrolled in North High, and his real name is unknown, his nickname Kyon was created for him by his aunt and then spread by his little sister.